How the EU has inadvertently become the best democracy promotion organization the world has ever known. 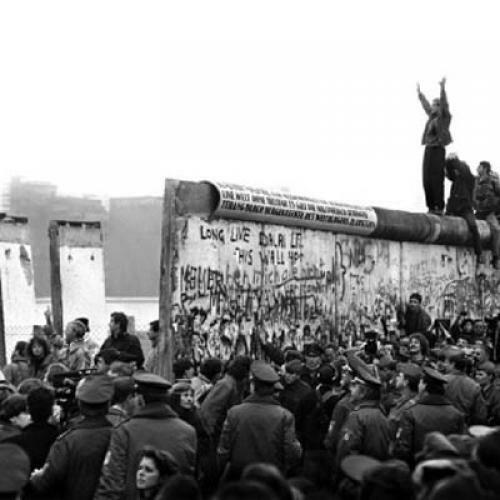 Monday marks the twentieth anniversary of the fall of the Berlin Wall. It is worth pausing to recall just how momentous, and unanticipated, this event and those that followed were. My students today have no memory of the cold war; to them, Prague and Budapest, just like Paris and Madrid, are simply places to visit or study in Europe. For the people who lived under communism, however, the system's collapse ushered in an economic transformation unlike any the modern world had ever seen: inflation wiped out the savings of millions of people; unemployment went from being (officially) non-existent to a chronic problem; and homes, businesses, and entire industries passed from state hands to private ownership. At the same time, consumers suddenly had access to goods and services that hadn't been available behind the Iron Curtain, and, for the first time in decades, entrepreneurs were able to start their own companies. Along with these economic changes--at least, in most of the countries--came elections and the potential for democracy, so long denied to citizens in the communist world. However, the success of democratization in the post-communist states has varied considerably. 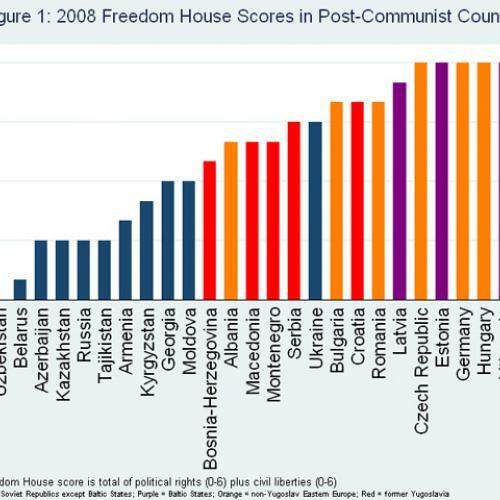 The chart below represents the Freedom House rankings of how democratic these countries are, as of 2008. The scores vary from a minimum of 0 to a maximum of 12, and the bars are colored-coded by region: former Soviet republics, excluding the Baltic states (blue); the Baltic states (purple); and Eastern Europe (orange), excluding the countries in former Yugoslavia (red). The geographic patterns are unmistakable. The highest Freedom House scores are in Eastern European countries and the Baltic republics (Latvia, Lithuania, and Estonia); the lowest scores are all in the former Soviet Union. The only former Soviet state (outside of the Baltics) with a relatively high score is Ukraine. The war-torn republics of the former Yugoslavia make up much of the middle ground. What might explain these patterns? The seemingly obvious answer--the experience of having been part of the former Soviet Union--is belied by the fact that the Baltic states have very high scores. Another potential explanation is religious culture; some experts have suggested that Catholic and Protestant countries are likely to be more successful at democratization than Eastern Orthodox or Muslim countries. While there is some correlation here, religion cannot explain why Orthodox Bulgaria has a much higher Freedom House score than Orthodox Russia, or why Muslim Albania has a much higher score than Muslim Turkmenistan. Similarly, while war undoubtedly undermines democratization, we do not find Bosnia-Herzegovina, Croatia, Serbia, Russia, and Tajikistan--the five post-communist countries most affected by war in the 1990s--anchoring the left-hand side of chart. Rather, the factor with the most explanatory power seems to be a country’s relative chances (largely dependent on geography) of being granted membership in the European Union. Consider the eleven post-communist countries, including East Germany, that have entered the EU: Their average Freedom House score is 11.5, and no country has a score lower than ten (the score of newest EU members Romania and Bulgaria). Conversely, the mean score is only 4.7 for the 16 post-communist countries that have neither joined the EU nor ascended to candidate-country status. Moreover, the states in former Yugoslavia, which continue to have long-term options for joining the EU because they are located right next door, are found in the middle of the scale, despite the fact that they've waged bloody and costly wars over the last 20 years. The simple answer for why the EU has had such a profound impact on post-communist states' political development is that it requires countries to meet numerous membership criteria, one of which is a democratic system. But, more complexly, this is probably what social scientists refer to as an endogenous relationship: Yes, the EU is more likely to admit democracies, but countries with a realistic chance of getting into the EU are also more likely to build and maintain a democratic system, precisely because it eases entry into the EU. The key here is that EU membership provides (or, at least, is perceived as providing) a host of benefits to its new member states. These benefits--which are extended over time, not necessarily right when a country enters the EU--include unfettered access to European markets, the opportunity for a country’s citizens to travel and work in other member states, and generous amounts of development aid. And, beyond these tangible economic benefits, for countries that spent the post-WWII era on the “outside” of Europe looking in, the chance to finally be on the "inside" may be too good to pass up. The irony is that the EU--unlike many international organizations--was never intended to function as an instrument of international democracy promotion. Rather, the EU was meant to provide economic benefits to its members; if there was a larger political goal, it was to contain potential conflict between France and Germany and to keep Germany firmly anchored in Europe. Instead, as Professor Milada Vachudova of the University of North Carolina has argued, the EU may have become the most effective, inadvertent democracy promotion organization the world has ever known. This is perhaps one of the greatest surprises of the post-communist experience. As the United States continues to push democratization as a foreign policy goal, there are lessons it can learn from the EU's influence over the old Eastern Bloc. As in other parts of the world, we have evidence that it is harder for democracy to take root in some countries than in others. But the explanation in the post-communist context is not because democracy works where the people demand it and not where outside forces impose it, as has been suggested in the aftermath of Iraq and Afghanistan. Both Russia and Poland, for example, featured eager populations and crowded, multiparty elections in the 1990s, but today, the latter is a fully functioning democracy while the former clearly is not. Instead, the post-communist experience highlights the important lesson that democratization may be more likely to succeed when there is a regional organization of states offering valuable incentives for other countries to join its ranks. This is not to say that people need to be bought off, but rather, that incentives (such as the benefits of EU membership) can help transition countries clear the early hurdles on the road to democracy. Unfortunately, it's an open question whether there are any international institutions comparable to the EU, in terms of the inducements they can provide. "Most favored nation" status is nice, but it might not compare to the tangible advantages of being in an organization like the EU, which offers the opportunity for visa-free travel and work, the chance to sit at the table (and, occasionally, even at the head of that table) in regional policymaking discussions, and access to the world’s single biggest economy. To the extent that analogous institutions do not exist, for example, in the Middle East or Africa, perhaps one of the long-term goals of U.S. foreign policy should be thinking about how to help create them. Joshua A. Tucker is Associate Professor of Politics at New York University, a National Security Fellow at the Truman National Security Project, and a co-author of the political science and policy blog The Monkey Cage.